The following article is from the website of the Popular Front for the Liberation of Palestine, a Marxist-Leninist organization that has now been waging armed struggle against Imperialism, Zionism, and Arab reaction, and for socialism and national liberation, for 42 years. They fight for a singular, secular Palestinian state in all of historic Palestine. The PFLP’s General Secretary, Ahmad Sa’adat, is currently imprisoned by Israel. Please see also the PFLP’s 42nd anniversary statement, “Time for a new political era of resistance and national liberation” and the statement of solidarity to the PFLP on their 42nd anniversary from the Freedom Road Socialist Organization. 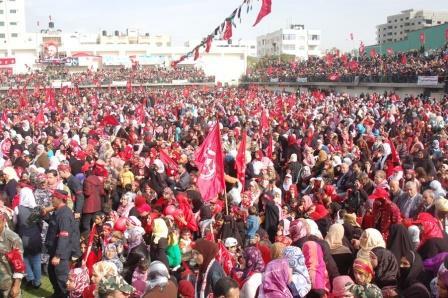 Over 70,000 cadres, members and supporters of the Popular Front for the Liberation of Palestine, and the people of the Gaza Strip, converged on Palestine Stadium for the 42nd anniversary rally of the PFLP on December 12, 2009, spilling into the surrounding streets and carrying Palestinian flags, PFLP banners and posters of the Front’s martyrs and leaders. Comrade Dr. Rabah Muhanna, member of the Political Bureau of the PFLP and leader of its branch in Gaza, called for maintenance and escalation of resistance in general and armed struggle in particular against the Zionist enemy, calling for a nationally coordinated resistance framework serving the struggle to regain our rights. Comrade Muhanna emphasized that the path of negotiations, from Oslo to Annapolis, has clearly reached a dead end, and there must be a declaration by all Palestinian forces of the final death of the path of so-called “negotiations” and the immediate end of the so-called “transitional period,” including a complete end of all security coordination with the occupier. He expressed an urgent call for national unity, saying that it is a necessity for victory and that all political detainees in the West Bank and Gaza must be freed, and unity established on the basis of Palestinian national cause and the Palestinian national interest, responding to the sacrifices of thousands of martyrs, wounded and prisoners: ensuring an independent state with Jerusalem as its capital, self-determination, and return. 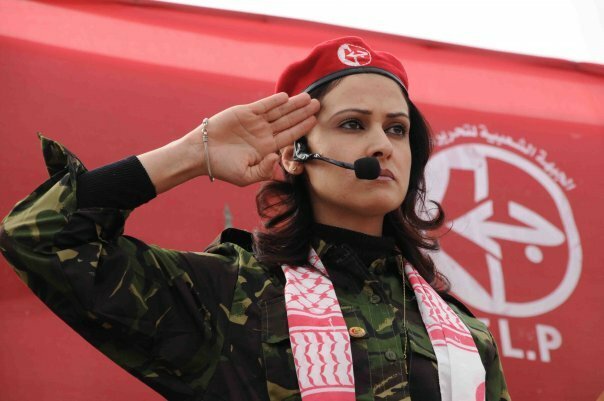 Comrade Muhanna saluted the Palestinian people in occupied Palestine ’48, in the West Bank, throughout Gaza, in the camps, and throughout the world in diaspora and exile, expressing the Front’s complete determination to fight for the achievement of full victory over the criminal, fascist, occupation regime. He outlined the Front’s historical experience in confronting Zionism, as an extension of the struggle of the Arab Nationalist Movement. 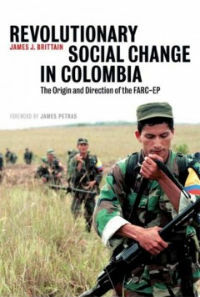 He said that the Front will continue along the path of its history in the revolutionary struggle to achieve victory and the utter defeat of the criminal Zionist enemy and the entire camp behind it that provides it with its power and aggression and weakens our people and prevents their progress, the imperialist camp and its reactionary arms and components, under the savage leadership of U.S. imperialism. Comrade Muhanna closed his speech with a call for national unity, invoking the colors of the Palestinian flag and the banners of the Palestinian factions: green for Hamas, white for Fateh, black for Islamic Jihad and red for the PFLP, calling for all of our people to be united together under the complete national flag of Palestine. Almazah Sammouni, who lost her family in the December 2008-January 2009 aggression on Gaza, spoke, saying “I came here today not to cry or to mourn for my family,” the Sammouni family, “who suffered under the fires and missiles of the occupation like thousands of martyrs of our people, but I come to express my pride for their sacrifices and commitment.” She called upon all Palestinian forces, particularly Fateh and Hamas, to unite under the banner of the blood of the martyrs and the promise of a better future for our people and children, and to fight to prosecute the occupation and its leaders in international courts for their crimes against our Palestinian people. Comrade Amna Rimawi, the wife of imprisoned Comrade Majdi Rimawi and head of the village council of Beit Rima, one of the heroes of the legendary October 17 operation that struck Zionist extremist tourism minister Rehavam Ze’evi, spoke at the rally, expressing her greetings on behalf of the families of the prisoners, and calling upon the captors of occupation soldier Gilad Shalit and asking them to uphold the standards they have set for the prisoner exchange, because the families and the prisoners know the only means for their release comes through the resistance. 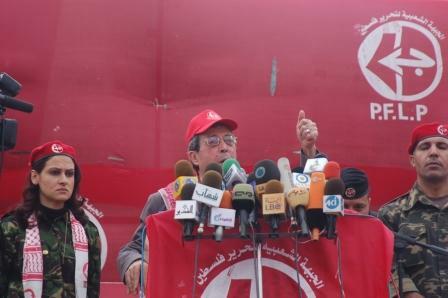 The rally, chaired by Comrade Hani Al-Thawabteh, member of the Central Committee of Gaza Branch, and Comrade Shireen Abu-Oun, also included poetry, artistic presentations, and dozens of congratulatory messages from the PFLP leadership abroad, Hilda Habash, the wife of the founder, Dr. George Habash, and the General Secretary of the Front, imprisoned Comrade Leader Ahmad Sa’adat. This entry was posted in Israel, Marxism-Leninism, Palestine and tagged Ahmad Sa'adat, Almazah Sammouni, Amna Rimawi, Annapolis, Fateh, Freedom Road Socialist Organization, FRSO, Gaza, George Habash, Hamas, Hani Al-Thawabteh, Hilda Habash, Imperialism, Islamic Jihad, Israel, Majdi Rimawi, Mohammad Khalidi, National Liberation, Oslo, PFLP, Popular Front for the Liberation of Palestine, Rabah Muhanna, Rehavam Ze'evi, Revolution, Shireen Abu-Oun, Zionism. Bookmark the permalink.